The international graduate admissions procedure is open to applicants having completed their university education in an institute outside of France and who wish to apply to Master’s programmes or graduate dual degree programmes. Admission decisions are announced on a rolling basis, and are solely based on the evaluation of the online application, including the documents which were provided. Check the admissions and scholarships calendar. Create an account, log in and fill your application: https://admission.sciencespo.fr. It is normal to experience a wait of up to two hours before receiving the activation link. You cannot use twice the same application form. If you already applied on a previous year, you must create a new application form. Campus France: If you come from a country using the CEF procedure, please note that you cannot apply to Sciences Po through their system. In order to apply to Sciences Po, please follow the instructions on this website. or a Masters programme and a dual degree programme. In this case, the dual degree programme must be specified as your first choice. You cannot apply for two dual degree programmes or two masters programmes. You cannot apply for a Ph.D programme and another programme. Please note: You may only apply to Sciences Po programmes once by academic year. If you are not accepted, it is not possible to apply to a different programme on the same year. You may not apply through another procedure in the same academic year: this procedure may not be combined with any other in the same year. Start your application by filling in the reference section. This will ensure referees have adequate time to reply. Only complete application forms will be reviewed, and they must include the requested references by the deadline of the programme. It is your reponsibibility to make sure your referees have submitted their form on time. More about the references. If required, take the language tests as soon as possible. Two to three months may be needed to obtain your language test scores. You must therefore take the necessary precautions in order to provide your results whilst respecting the deadlines. You must include your language tests by May 15, 2019, at the latest if you apply for a Master programme, or by the deadline of the scholarship or the dual degree programme you are applying for. In order to ensure treatment of your application, it is your responsibility to check that your application is complete and that all the required supporting documents are attached in the right format no later than the relevant deadline. Once your application is ready for the first review, no new document will be accepted, unless required. More information on the required supporting material. The application reviewers read a lot of personal statements each day and appreciate those which have been carefully written and structured. It is important that the applicants express a concrete idea of the professional field (or even position) that they are aiming for, and that they state clearly what aspects of their personality or background have led them to make this choice. The fit between the applicant's career plans and the training sought is evaluated in order to ensure that the prospective student stands to gain the most from it. It is important to us, and to the applicants, that we offer them the training and academic framework that they need.The applicant must therefore clarify the reasons why they have chosen the given programme, what exactly are the aspects they find attractive and explain how Sciences Po would be an integral part of their plans. When applying to different programmes, you must write two personal statements in separate online spaces. The application fee of €100 is not reimbursable. We do not offer fee waivers, unless you have a refugee status. In that case, please contact us and attach the official proof of your refugee status. Please note: paying the application fee does not mean that your application form has been submitted. Make sure to submit your application form by clicking on the Submit button. To be eligible for assessment, your application must be complete and submitted before the deadline for the programme to which you are applying whilst also respecting the deadlines for scholarships, where applicable. If you apply to several programmes with different deadlines, you must respect the earlier deadline.Once you have submitted your application, you will not be able to make changes to it, neither will we. When you have submitted your application, you will be able to access the dashboard on your application form in which you will be able to track the status of your application and check if your referees have filled your academic and professional references. Please wait at least 15 days before contacting us if you see that the status of your application has not changed. Applicants will be informed of the outcome of their application through their dashboard and by e-mail. Find out the first steps (calendars, access your online student account, register, choose your courses, etc.) and check our page for international students. If you do not hold the undergraduate degree required for the programme at the moment you accept the offer of admission, you must provide it by the time of your administrative registration (beginning in June). If you cannot provide such a document at the time of registration, you will lose your admission offer. Please note that you should have been awarded your degree in the first examinations, and not after having taken re-sits. We understand your disappointment and your wish to know more about the reasons for our decision. Here are some of the factors that may explain why your application was unsuccessful. 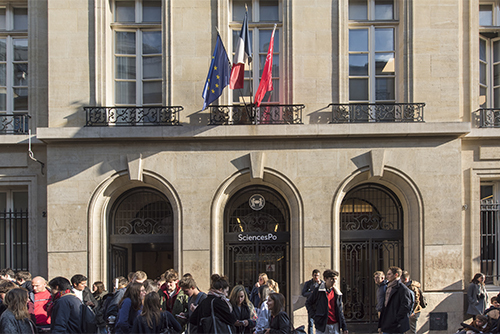 No admission procedure at Sciences Po provides for a waiting list.